A political campaign is only as successful as the supporters and fundraising behind it. Fundraising for a political campaign is always necessary to garner the political support to push your candidate to the finish line. 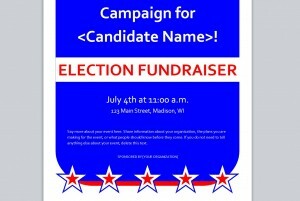 This political flyer template is an easy way to let everyone know the important details for your fundraiser. The easily customizable template features a patriotic star design on the top and bottom, along with bold colors and eye catching text. Help your political candidate stand out by downloading this political flyer template. First, download the free, easy-to-use political flyer template found on this page. Once it is saved to your computer, customize it with the basic information about your fundraiser: your candidate’s name, date and time of the fundraiser, the location of the fundraiser, and which organization is sponsoring this fundraiser. Second, use the paragraph just above the “sponsored by” section to inform your readers of the most important details about your political fundraiser. For example, let everyone know whether this event will be a steak dinner with $5 admission or a more casual, kick-off event. Don’t forget to include a contact phone number, email address or webpage. Third, proofread all your text thoroughly and make sure you haven’t missed any important details. The paragraph just above the “sponsored by” section is a great place to include all the juicy details that will draw people to your event. Will there be door prizes? Let people know. Free refreshments? Write it down. This section should also include critical information such as: how to purchase tickets, whether to RSVP, and a web address for your political candidate. Fundraising for a political campaign is a huge part of the election process and you can use this free template to make things just a little simpler.